During regular academic semesters, members and supporters of the Chanticleer Intelligence Brief gather once a week to get to know each other, discuss current events and participate in fun activities, like the CIB weekly news trivia quiz. 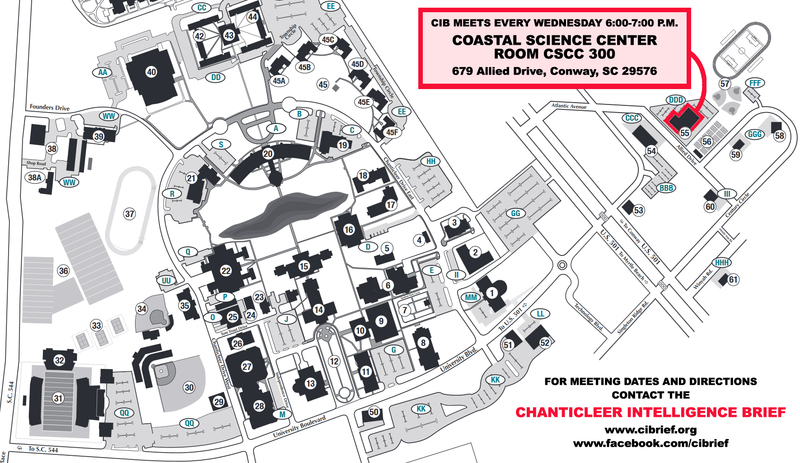 For the spring 2019 semester, the CIB Executive Team invites the organization’s membership and prospective membership to meet every Wednesday from 6:00 to 7:00 p.m. in room CSCC 300 of the Coastal Science Center Complex, located across US 501, at 679 Allied Drive, Conway, SC 29576. The first meeting of the semester will take place on Wednesday, January 23. To access a Google Maps image of the location, click here. Driving to the CSCC from CCU’s main campus takes no more than 5 minutes. Ample student parking is available at the CSCC location, adjacent to the building. Alternatively, you can take the black shuttle, which runs every 10 to 15 minutes on class days, from 6:30 a.m. to 11:30 p.m. Below is a map of the meeting location for your convenience. Click on the map to see a larger version. As a reminder, students who wish to enroll in “Applied Intelligence Analysis” (the official CIB class) are expected to have been members in good standing of the CIB for at least one regular semester prior to taking the course. “Good standing” includes participation in 75% of all weekly CIB club meetings during the regular semester prior to taking the course. Therefore, a student who intends to sign up for the CIB class in the fall of 2019 must attend at least 75% of the Wednesday evening club meetings this semester. We hope to see you every Wednesday.